The garden is a place for enjoyment and relaxation. It may be designed as an extension of the house, with decks and patios, or as a beautiful retreat to escape the turmoil of modern living. 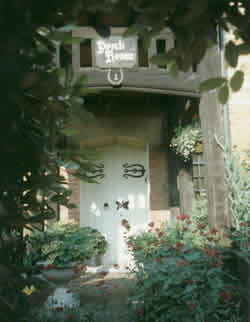 A place for energy or just quiet reflection. Whatever your choice of garden layout, most designs benefit from some form of structural division like a fence, screen, trellis or balustrade. Using timber for the structures will ensure that they always blend with their surroundings. Adding individual details like well chosen finials will transform an otherwise plain structure. Finials are one of the earliest forms of architectural ornamentation and are an easy and economical way of adding the details you need. 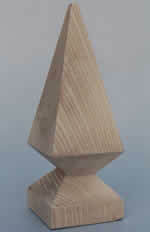 Finials can also provide a focal point on garden buildings like pergolas and conservatories. They are normally used at the apex of a roof to draw the eye, but they can also be used to great effect as "drops" to emphasize the shape of an arch. We design and make finials, cappings and turned posts to enhance garden structures. 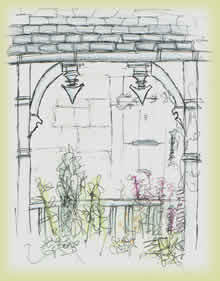 Catering for all tastes we have designs to suit modern as well as traditional settings. These designs can be altered to suit your requirements, or we can produce work to customers own designs. 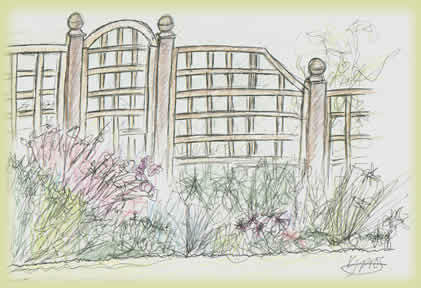 In fact, some of the designs shown here were developed in conjunction with broadcaster, writer and garden architect Bunny Guinness and used in her books and television programmes. All our finials are hand turned which enables the finished product to retain that all important crisp detail which is missing on mass produced items. Prices depend upon size, timber and quality. Please contact us for a quote. Trade enquires welcome. We use good quality softwood which is pressure treated after turning. If you prefer the timber to weather, or if you need to match existing structures, ash or oak can be used. On square posts, the finials usually fit on top of standard capping plates. 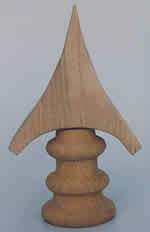 On round posts the finials can be made the next size up to provide an overlap. Alternatively, round capping plates could be made at the same time as the finials. Fixing the finials is simple. I leave a 1" (25mm) diameter peg on the base, which drops into a hole drilled through the cap and post top (3/4" is used on 3" finials). If drilling the post presents a problem, then double-ended woodscrews can be used. Tall finials are ideal for special situations. They can be used either side of a gateway or arch, or on top of a building. They can be modest or spectacular ! Here are three additional designs. On staircases as newel caps and drops, on curtain poles, cabinets and clocks.